Beautiful renovated 4/5 room apartment with a lovely decoration. 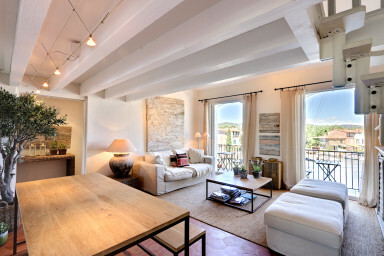 It is located on the top floor of a small building in the center of Port Grimaud less than 5 minutes away from the beach and was organized to use the whole space. Thus a mezzanine has been built to create an additional bedroom or space for storage. It is also composed of a living-room, a kitchen, 3 bedrooms and 2 shower-rooms. On the canal side, a balcony to enjoy sunrise. The 7m x 3m mooring to park a boat is only a few meters far from the apartment so that it will be easy to use it to visit the canal or go to Saint Tropez by the sea.